This post was going to be all about me – my resilience, my trip to New York, my seeing the city, and myself, in a new, positive way. Instead, I write about a terror attack near the World Trade Center, where pictures of mangled bicycles, stories of Argentinian friends, a battered school bus, overcome memories of a clear blue sky and leaves just tinged with gold. Resilience – New Yorkers have it in spades. And not only from September 11, 2001. I think that they’ve always had it – that it stems from a pride, even an arrogance, of living and persisting in one of the toughest, and greatest, cities in the world. It isn’t easy to live in New York, though I know that each borough has its own distinct personality. The gift to be able to “walk anywhere” is one that comes with a few strings – you have to be physically able to do that, and at a pace that would set the heads of most non-New Yorkers spinning. 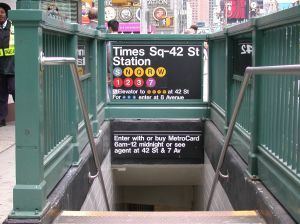 The subway is always handy – and, depending on your definition of “handy, that could be eight or nine blocks away. And those steps…. not for the faint of heart. You need strength to live in New York, physical and psychological. I recognize that by spending only a few days there. And with strength comes resilience. And sadness. And heartbreak. You can target this city, founded on trade, and money, and what some might consider the worst qualities of our country, but you cannot break it. And for that, we must learn a lesson and be proud.